When it comes to a destination vacation, Hawaii will often be near the top of the list. Beautiful beaches, tropical weather, sun, sun, and more sun. While some people could spend all day, every day, frolicking on the beach, I like a little more variety. Something far away from water. For us landlubbers, a good hike is exactly what we need. 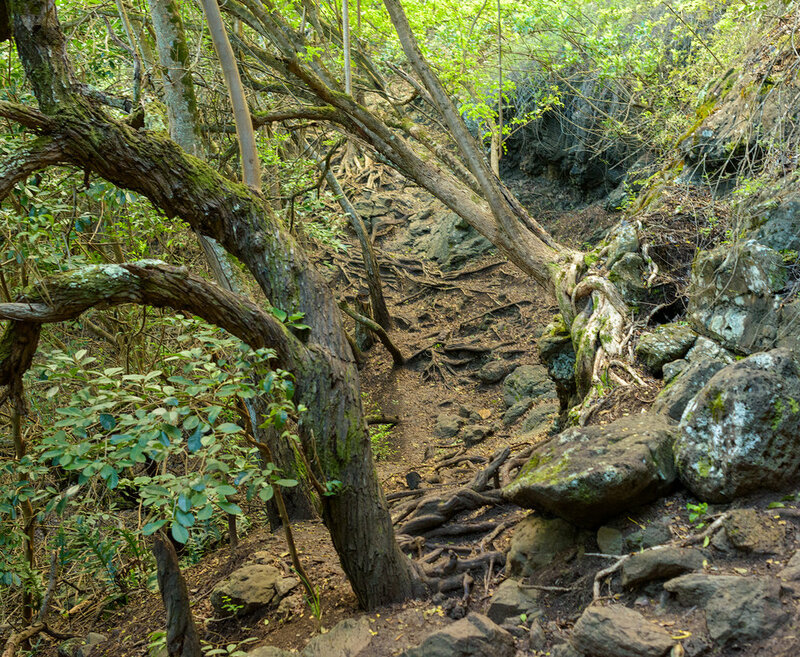 Luckily, Kuli’ou’ou Ridge Trail is here to save the day. 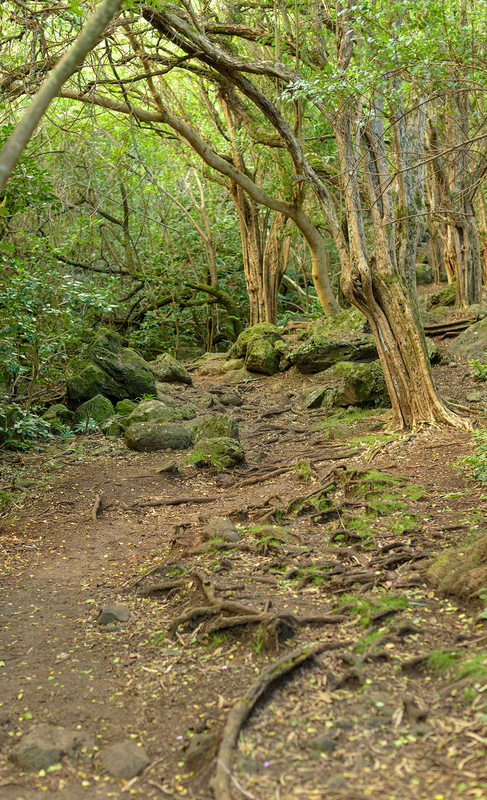 At the end of a cul-de-sac, in a quiet residential neighborhood, you’ll find the trailhead for Kuli’ou’ou Ridge Trail. When I looked this hike up on Google Maps, I didn’t think it could be right. But, it is. There isn’t a designated parking lot for the trail, and your vehicle will get towed away if you park in the cul-de-sac. So you’ll probably have to find a spot along the road, and walk a little bit to the trailhead. Once on the trail, stay to the right. There is a paved footpath, on the left, that leads to a different trail. There is a sign marking the trail, so if you stay to the right, and see the sign...you’ll be good to go. The beginning of the trail is very rocky, but usually dry. If it has rained overnight, then these rocks could be very slippery. Just what your footing. After just a few yards, you’ll start the first switchback...and then it’s switchback after switchback. The elevation gain is consistent, but not intense. If you’re tired of weaving around rocks, just be patient...the environment changes many times. One of more interesting parts (and the first terrain change) is the Ironwood Forest. While I really enjoy the Ironwood, it is an invasive species, and isn’t native to the Island. It’s illegal to plant Ironwood, and an example of how a plant (or animal) can take over a native ecosystem. The path isn’t as rocky at this point, and is now covered in the long, needles that have fallen from the Ironwood canopy. The switchbacks continue to snake their way up the hillside, along the needle-covered trail. A little more than the halfway point, you’ll find a rest area with benches, and picnic tables. Catch your breath, and get a drink of water...the hard work is just beginning. Just pass the rest area, a fairly steep hill, covered with interlocking roots, leads to the next terrain change. The first time I hiked this trail, these roots were slick with rain. It was very difficult to get up the hill. Take your time, and you’ll do just fine. Eventually, you’ll make your way to a forest of Norfolk Island Pine trees. 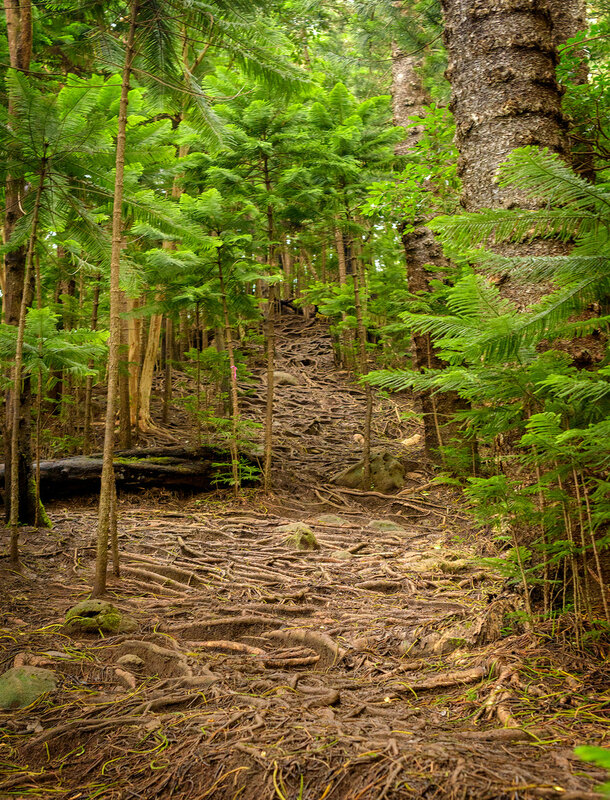 Cook Pine and Norfolk Island Pine were introduced to the islands in the 1870s. The pine trees in this area are huge, reaching high above up to 150ft. Are you ready? Because here comes the most difficult part of the hike. The stairs. I don’t know how many total steps there are, but you’ll be glad when it’s finally over. The steps serve an import role in helping lessen the impact of erosion, but it’s a lot of effort to climb them all. There is almost always clouds clinging to the ridge top, so the steps will be slick and muddy. Take your time, and enjoy the views around you. Trust me...it’s worth it. A lot of times, you’ll get to the top…and nothing. The clouds may or may not be clinging to the ridge. Once you finally reach the top, a blast of wind greets you. You’re looking onto the windward side (emphasis on wind) of the Island. Luckily, the clouds did open up, and spectacular views of Koko Head Crater and the glistening aquamarine ocean stretching before you. Sit down, relax, and take it all in. The views above the clouds are why you’re here.